The propagandists disguised as "fact-checkers" at the Washington Post unleashed pent-up frustration Wednesday when they evaluated President Donald Trump's February 5 claim that wages are, "for the first time in many years, rising." They gave Trump's claim its worst possible evaluation of "Four Pinocchios," i.e., a "whopper." Too bad for the Post that detailed work published by Reuters two days earlier had already debunked its evaluation. The Post's text and its accompanying video betray glee at picking Trump's claim apart. According to The Fact Checker’s database of Trumpian claims, the president in his first year eight times falsely suggested that wages were finally rising because of his policies. He also made a similar claim in the State of the Union address. After his statement in Cincinnati, several readers suggested it was time for a substantive fact check, with a Pinocchio rating, rather than simply filing it away in the database. NARRATOR: Most economists agree overall wages have been rising since 2014, and wages for non-production and supervisory workers have been going up since 2013. Given the video's title (which should have focused on when Trump took office, not when he was elected), debunking the Post's Four-Pinocchio evaluation (the real "whopper") can now proceed. "Most economists" say wages have been rising for some time. Unfortunately, the data supporting their claims was absent — until 2017. As I noted at my home blog last week, some credit should also go to tougher immigration enforcement and Trump's efforts to rein in regulations. No state reported overall wage losses in 2017, while 10 did in 2015 and 2016. 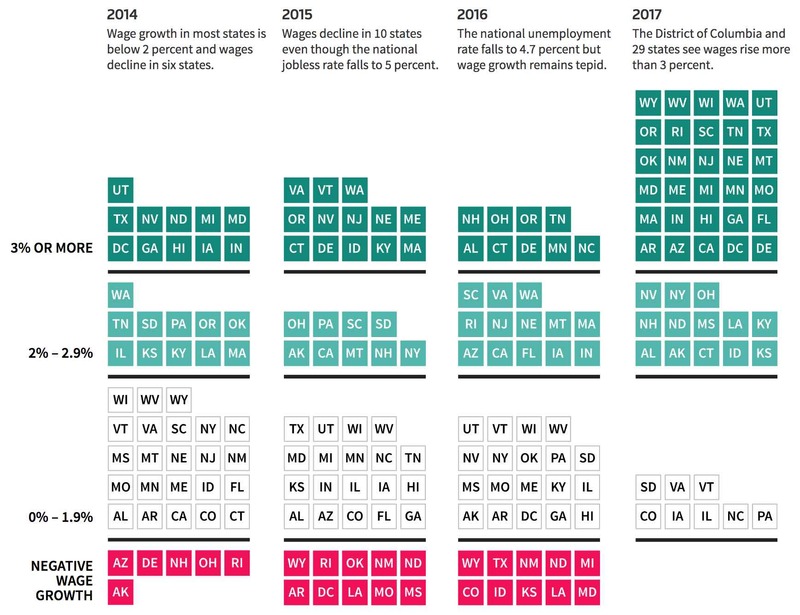 29 states and DC reported inflation-beating wage gains of 3 percent or greater in 2017, more than double the number of states which did so during each of the previous three years. The table shows that the wage-growth deteriorated from 2014 to 2016, and that states containing almost one-fifth of the nation's population saw weekly wage declines during Barack Obama's final calendar year in office. Meanwhile, the population of states with 3 percent or greater wage growth fell during those years — until quadrupling to nearly two-thirds of the population in 2017. But the "fact checkers" at the Post let the "facts" be determined by the supposedly neutral Jay Shambaugh at the Hamilton Project. That's a project of the left-leaning Brookings Institution. Mr. Shambaugh, the expert sticking up for Obama, was...a member of Obama's Council of Economic Advisers. The Post doesn't put those facts on the table for readers to consider. The Post should have been aware of Reuters' February 5 findings when it published its clearly flawed February 7 "fact-check" — but the paper's determination to hang Four Pinocchios on Trump was apparently too great.